David- Why not include the study abroad students in the study? What are the gender/racial profiles of those students? What are the real numbers, in terms of %. 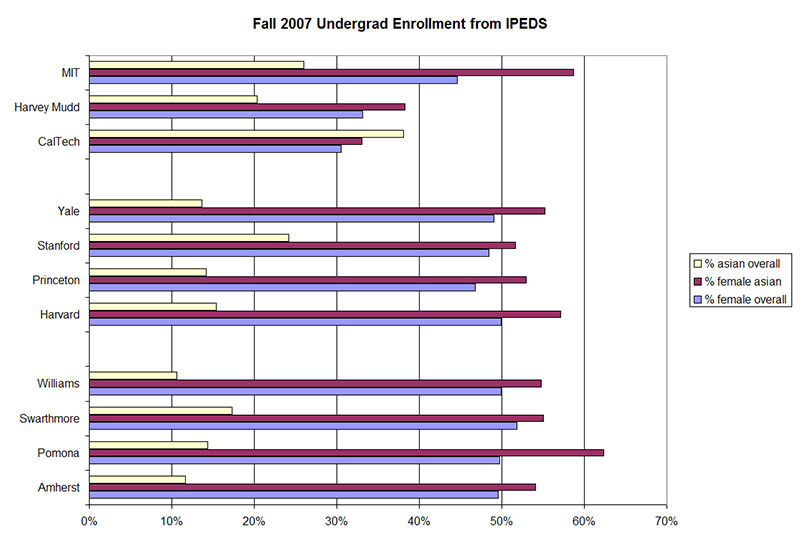 PTC: The study abroad numbers are not broken down into a full race/gender grid. We know how many Asians went abroad (although that data is for a different year) and how many females, but not how many Asian females. So, we can’t just include this data in any simple way. But, of course, this is a really interesting statistical question. You could estimate the breakdown and then add things back in, along with some confidence intervals. An excellent homework problem for my Winter Study class! Eyeballing things, I don’t see how it would matter much. The standard explanation for this effect is that female URMs on average have much stronger high school academic records than make URMs. So, it its attempts to get enough URMs while simultaneously maximizing a student’s chances of success at Williams, the College has no choice but to put up with a gender imbalance. Isn’t that the standard story? Actually, the “standard” story goes beyond that. Large numbers of African American and “hispanic” males in the United States have no high school academic records period. They drop out of high school at very high rates, even when compared to females in the same ethnic group. I’ve read Swarthmore’s Admissions Dean Jim Bock cite the low numbers of African American males graduating from high school as an obvious impediment to college recruiting efforts. As you can see, fewer than 1 in 2 black and hispanic males graduate from high school in the United States. There are double-digit gender gaps, nationally. Mississippi has a 20% difference in black male and black female high school graduation rates. 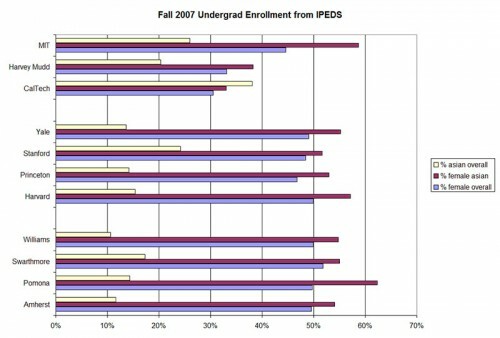 Study abroad students are not counted in reported enrollment numbers at most colleges because of the government IPEDS reporting rules. They ask that you disregard students enrolled elsewhere, unless they are paying tuition directly to the home college. Most colleges do not collect tuition from study abroad students and thus do not count them at all. Some colleges count study abroad students paying tuition to the home college and enrolled in a home college operated study abroad program (I don’t think Williams counts their Exeter students, who I believe pay the Exeter program, not Williams.) Some schools, where tuition is paid to the home college (such as Swarthmore) count everyone. They consider their study abroad students to be full-time enrolled students at Swarthmore, same as any other student, since they are paying full tuition, room, and board. This makes comparing any number of statistical measures problematic and sometimes makes it hard to even figure out how big a achools is. It took me a long time to figure out why I kept seeing Williams undergrad enrollement as 2135 some places and 1995 others. On this Asian gender imbalance, I sent DK a chart to add to his post. The female tilt for Asian American students is consistent across a range of schools and more or less proportional to the % of women in the overall student body (just somewhat more female tilted). There is one glaring exception: MIT. Either the data is wrong (possible) or MIT is using their huge Asian American applicant pool to offset the heavily male tilt of the school. Otherwise, I don’t see any particular trends. I would caution that the Asian American label encompasses a ridiculously large and diverse group from Japanese to Chinese to Korean to Vietnamese and Cambodian to Indian and Pakistani. This ethnic category is hardly homogenous. HWC: minor point in your post, but I think more leading liberal arts colleges now in fact charge home fees (home tuition) than not. It is controversial, of course, because if a student pays Wesleyan $50K to go to the Univ. of Bologna, and is sitting next to a student from a school that does not charge home fees, it is likely that student is paying about $15k/year. They talk, parents call deans at Wesleyan, and you know how that goes. I would check with NAFSA, the professional association for study abroad administrators. I know from experience that a much larger number of Williams’ peers now charge home fees than just 5 years ago. Very lucrative, to say the least, and might be a target of Congress (threatened last year during the mandatory 5% spend rate discussions). Even charging home fees, study abroad is a big money loser for most colleges. It’s easy to see why. For a regular student, financial aid is just a price discount. It doesn’t actually require a cash expenditure; it’s just knocking a few bucks off the price (so to speak). For study abroad students, financial aid is often a cash money transaction. Swarthmore, for example, charges home fee tuition, room, and board (with financial aid discounts) to all study abroad students and then pays the study abroad program and writes checks to the student to cover air fare and walking around money. Over the last three years, the net cost to Swarthmore for study abroad has ranged from $560,000 to $1 million — the actual cash they spent above and beyond what they received in home fees. So, they are coming up short by an average of $6,000 to $7,000 per study abroad student. It wasn’t supposed to work out that way when the policy was implemented! What you are saying does, however, impact program selection. One of my daugther’s early choices was considerably cheaper than a semester at Swarthmore. We all agreed that would be a foolish choice given Swarthmore’s pricing system. She ended up doing a program that cost more than a semester at Swarthmore. Two Williams students were on the same trip and they had to pay more than their usual Williams charges for that semester. There are a lot of colleges taking a long hard look at the cost of study abroad programs. Middlebury, for example, operates a lot of their own programs and has just put them on notice that they have to operate at break-even, that Middlebury will no longer subsidize the programs. At the end of the day, places like Williams and Swarthmore are subsidizing full-fare students on campus to the tune of $25,000 to $30,000 a year, so the study abroad subisidies are a bargain. However, they are a cash subsidy that jumps off the operating expense page in an itemized way that the home student subsidies do not. HWC — you make some interesting points. However, I think if you engaged NAFSA folks, or many study abroad offices beyond Swarthmore, you will find that the majority of colleges come out much better charging home fees. One issue is financial aid and whether a school allows fin aid to travel to programs not associated with the home school. Consider the difference between a school that charges home fees and one that does not. At least with home fees, a school is getting significant fees, and if that school allows fin aid to travel with its student, consider the difference if they did not charge home fees. All $$ going out; nothing coming in. The fact of the matter is 90% of abroad programs are not as or more expensive than Swarthmore or Williams, and so colleges do better charging rather than not charging home fees. As for your point about Middlebury (a place I know well from former employment there), yes, administrators have given the warning that, in particular, the European programs need to break even, but not breaking even is a recent thing, related to the dollar-Euro exchange. In fact Middlebury’s program abroads net a significant profit for the College (all costs in), and the recent deficits were experienced at a small number of its schools (again, in West Europe) have reversed with the dollar’s (momentary?) rise since last year. Some sites, like in Alexandria, Egypt and Hangzhou, China (with two new sites starting up in China this fall), make a killing for Middlebury, as many other colleges are now sending their students on Middlebury programs and Middlebury only provides financial aid to its undergraduates (but collects tuition fees). The issue, though, is which approach loses less money for the many colleges that do not have the 33 sites abroad that Middlebury now has, and has most, if not all, of its students going to other colleges’ programs; it is whether they lose their shirts beyond that which they subsidize their on-campus students already, which, as you said, is 25k for the Swarthmores and Williamses, or just at about the same level. And of course what their fin aid policies are, and whether they fill the beds that the students going abroad leave open, as Middlebury has done for 35 years with its “Feb program” (which enrolls 90+ students/February to address the imbalance in the kids who choose to study abroad in spring vs fall), factors in as well. Many balls in the air here, but I would argue that charging home fees allows schools to feel less of a loss than they would experience if their students were paying directly to the program abroad they chose to attend, or simply charging them for the cost of that program. I agree with you that, in general, charging “home fees” for study abroad should generate more net revenue than not charging home fees, but writing financial aid checks. I saw a remarkably frank comment from Swarthmore, when they changed their policy, that their intent was to use the increased revenues to offset financial aid for low-lncome study abroad students. The biggest beneficiary of the home fee arrangement is the full financial aid student who faces no out-of-pocket cash expense as an impediment to study abroad. The big loser can be the full-fare customer who might find cheaper options. What some Swarthmore students do is simply take a semester off and do the lower cost study abroad without credit transfering. They often have enough AP credits to graduate without four courses from study abroad. Study abroad is an interesting topic that really has to be considered in the context of a tier of colleges. There are many large schools that do all their own programs, simply transporting 60 students and some professors to a classroom overseas and charging home fees. One more thought: You can tell the colleges a study abroad program targets by its pricing. The top study abroad programs are priced to match the cost of the top colleges and universities. Then, there are study abroad programs priced to match lower cost schools. EphBlog is powered by WordPress and delivered to you in 0.798 seconds using 39 queries..